Vancouver developer Pinnacle International has been busy in the GTA over the last decade or so, with multiple projects in both Toronto and Mississauga. One of their ongoing developments is Pinnacle Uptown, which is a 36 acre master planned community of both highrises and townhouses, located near Hurontario St. & Eglinton Ave. in north central Mississauga. Today we will look at the architecture of the very clean and modernist townhouses that are part of this development. There are 100 townhouses which are in various stages of completion. They are located in a triangular lot to the west of the current highrises, and are three stories. Each comes with a double car garage, located in the rear, something not easily found in the townhouse inventory of Mississauga. These townhouses were marketed and sold under the brand “Marquis Townhouses on the Park”. There are two new streets where the townhomes are located: Little Creek Road, and Four Springs Avenue. Amenities are located on the inside of the triangle, and are bundled and branded as the “Marquis Club”. Features include an outdoor pool, hot tub, party room, and outdoor playground. Each townhouse unit features an outdoor terrace over the garage, and 9 foot ceilings on the main floor are standard. 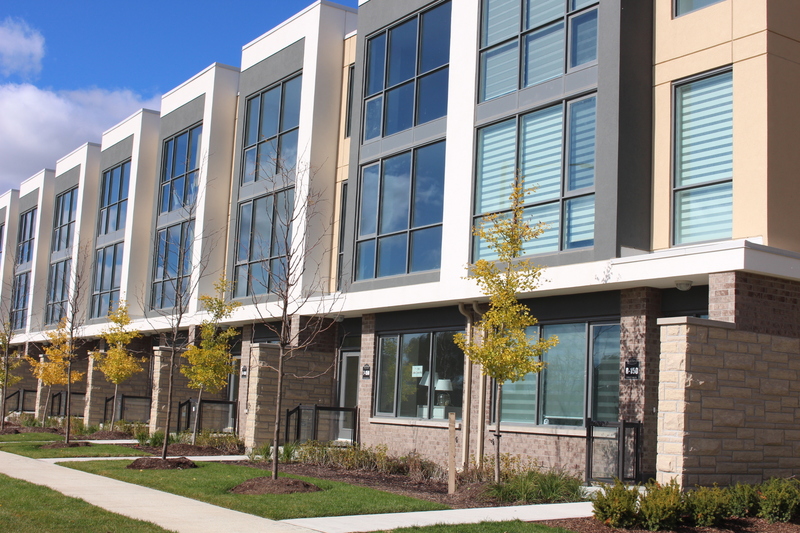 What we really like about the design of these townhomes are the clean, modernist designs. Colours are predominantly soft pastels and warm earth tones, with tan, or sand colours featuring, and there are clean white framing details. Each unit has plenty of windows, and should provide a bright and airy living experience. 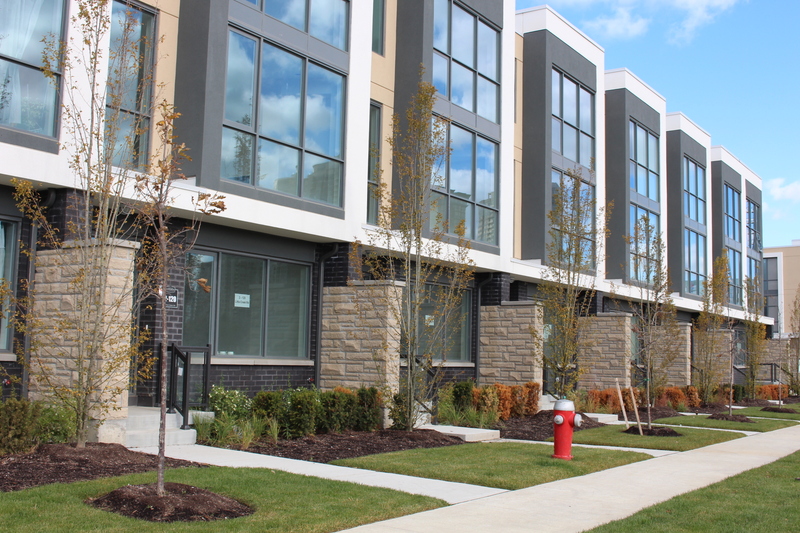 The townhouses of Pinnacle Uptown have a very clean look. The architects are Richmond Architects of Toronto. These are high end properties, each over 2000 square feet, and the few that remain for sale are in the $750K range.. Kudos to Pinnacle International for bringing such clean, modernist architecture to their Mississauga project. So many other developers are still stuck in the more traditional mode. It’s great to see a very urban design here in Mississauga. You’d expect it in the downtown areas of Toronto or Vancouver, so to find it here is yet another sign of Mississauga’s growing urban maturity. When I first saw these in person, they were like a breath of fresh air. Just my opinion, mind you! So what are your thoughts about this type of modernist architecture! Do you like these, or do you prefer a more traditional style? The location is good. Would you live here? Mississauga was recognized as one of the Top 100 neighborhoods to invest in Canada, in the recently published annual investment guide put out by Canadian Real Estate Magazine. I was asked to contribute to the article, and in it we review three separate areas of Mississauga – Clarkson, Cooksville, and Meadowvale Village. In the guide we review detailed information on population, population growth, vacancy rates, cap rates, average price, average rent, and projected cash flow. Clarkson has been selected as a good place to invest due to several reasons. 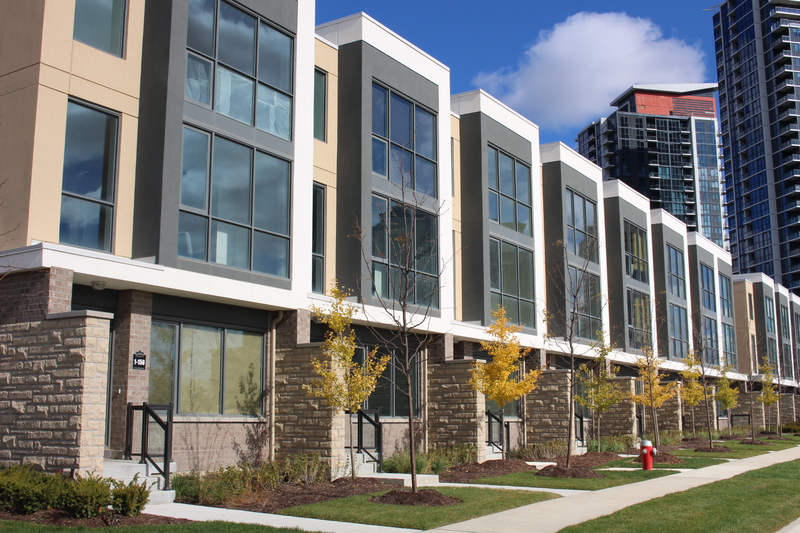 It is an older area, where the price of housing is a bit less than some of the newer areas of Mississauga. It nevertheless has an excellent location, with close proximity to the QEW highway, the Clarkson GO station, as well as good schools and shopping. One profitable strategy for investors in Clarkson has been to purchase semi-detached homes with a separate basement apartment. This way, the investor benefits from two streams of income – one from upstairs, and one from downstairs. Cooksville, along with Clarkson and Meadowvale, was one of the original towns which were amalgamated to form the City of Mississauga. Cooksville is centered near Dundas and Hurontario streets, the old intersection known as 5 + 10. It is also an older area, with pockets of reasonably priced homes that attract good rents. Cooksville may also benefit if the planned and fully funded Hurontario LRT is eventually built. As it is today Cooksville is ideally located near the QEW highway, and features Trillium Hospital, a major employer and source of good tenants. 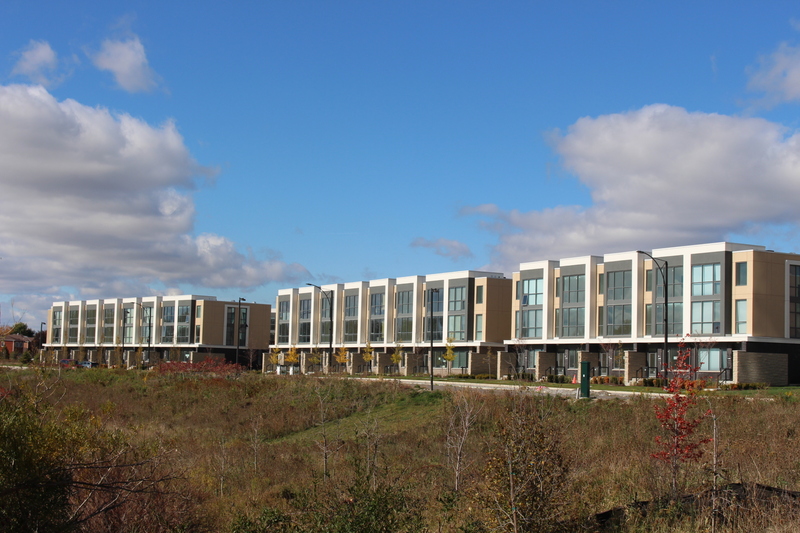 Meadowvale Village is situated in the extreme northern edge of Mississauga, and has great connectivity to Pearson Airport, highway 401, and the major employment areas which surround the airport. Once again, for the investor we recommend the semi-detached house, with a separate basement apartment, for an ideal source of two streams of income.